We believe that all people deserve to have a companion if they want support through labor, post partum, abortion, loss and bereavement. Therefore Serpiente is invested on working with individuals and families that would not normally be able to access these services. We offer discounted and work-trade only for low-income and no-income teen parents of color, undocumented families of color and LGBTQI families of color whenever possible. If you are interested on working with us and meet the criteria mentioned, contact us to inquire if we are able to support you with a reduced fee or barter. Also, make sure to look at the resource list we have created. 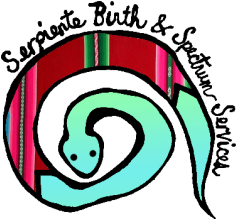 If you are interested on donating to Serpiente so that we are able to offer more reduced fee and narter services, contact us.